The accident below was caused by an accumulation of factors! 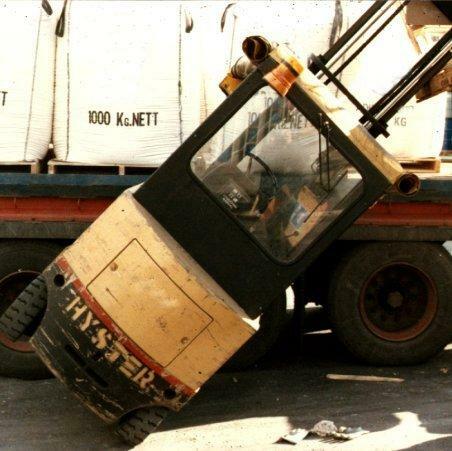 Did the forklift operator warn the truck driver of his presence? Did the truck driver check he was loaded before attempting to move? We don't know about this one for sure, though we can teach simple precautionary measures which a good forklift operator should adhere to. Accidents don't just happen; they are caused by people! At Transport Training Services, we believe that the correct approach is to explain to people what can happen before it really does happen. This accident was not staged, but actually a real life event. The driver was lucky, as he escaped without injury. Others have not been so fortunate. There are a frightening amount of accidents involving injury every year. Some are fatal. Operator training is an essential part of a mechanised industry and can help to prevent scenes like the one shown here happening on your premises. A relatively small investment, probably less than the cost of the first pallet load to be moved, will result in a well trained operator. All employers have a legal obligation to provide training for materials handling equipment operators.